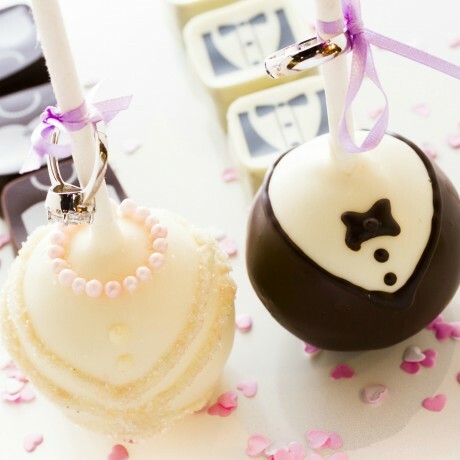 Bride and Groom Wedding Cake Pops. 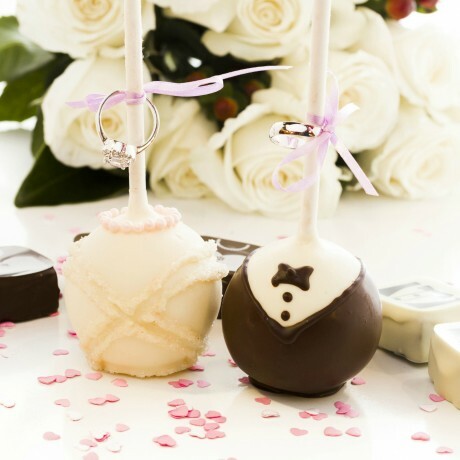 This wedding cake pop couple makes a wonderful centerpiece and can be used as wedding favours and gifts too. Fine vanilla moist sponge cake crumb particles are delightfully blended with rich butter cream frosting and formed into cake pops by hand. A lollipop stick is inserted before being given a generous thick coating of chocolate flavour melts. Edible decorations are added for drama. Store your cake pops at room temperature for up to 14 days. Your cake pops last in the fridge for up to a month or in the freezer for up to 4 months. Cake Pops tend to taste better at room temperature. Full ingredients available on request. The cake pops contains wheat, milk, soya and dried egg. All though delivery was late, it was no fault of the retailer, it was the delivery company it self. I was impressed with the cake pops. In the picture they looked small but they were big when I opened the box. The taste was great it was not too sweet just right. The colours were lovely at first I didn't want to bite into them as they looked so nice, and you can tell they were made with love and care. I would definitely be coming back and buying more. I have already told my friends and family how wonderful these cake pops are. Beware - The picture of the cake on this website is misleading. Beware - The picture of the cake on this website is misleading. The cake I received was less than 40mm deep, including the icing layer. Very poor presentation to the point this cake will not be making it to the Christmas table. Avoid and spend your hard earned cash elsewhere on a cake actually worth the price. This is my second order with this company, highly recommend. Absolutely fabulous Company. Easy to order from and makes my life so simple when vegan and G/F relatives visit. Food amazing, great selection and even I like it! Really lovely - just as advertised. Really lovely - just as advertised. However I thought they would be small enough to decorate a cake ! My mistake, just a bit too big so only put one in the middle of the cake. Handmade, all natural, high quality cake pops, assortments, and cake pops baking kits for any occasion.